Sunshine and a few afternoon clouds. High 89F. Winds NNW at 10 to 15 mph..
A few clouds. Low 63F. Winds NE at 5 to 10 mph. 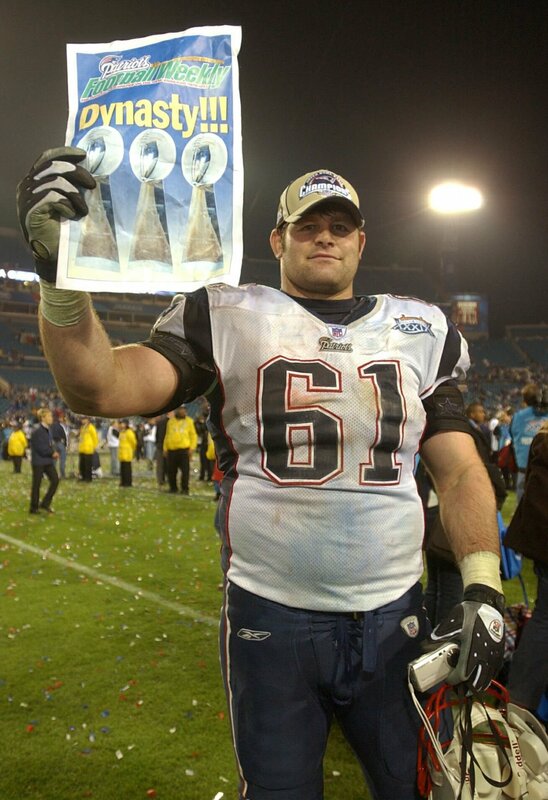 Former Cal State Bakersfield championship wrestler Stephen Neal holds up a newspaper signifying New England's third Super Bowl championship in four years following the Patriots' 24-21 win over Philadelphia in the 2004 Super Bowl. Stockdale High graduate David Carr won a Super Bowl championship in 2011 as backup quarterback with the New York Giants. Former NFL quarterback David Carr, Valley Children's Healthcare ambassador. Bakersfield High graduate Jeff Buckey started 12 games in 1997 while blocking for Hall of Fame quarterback Dan Marino. In a couple days, the biggest game of the sports year will get underway. With Super Bowl LIII kicking off Sunday, we tracked down a handful of former local athletes with professional football ties to get their prediction on the Rams-Patriots showdown. Bakersfield ties: Neal was a two-time national-champion wrestler at Cal State Bakersfield (1998, 1999). He held a 156-10 career record at the school and a 120-2 mark in his final three years. Career NFL highlight: After entering the league as an undrafted free agent, Neal eventually settled in as a starting guard for the Patriots. He played 10 years in New England, blocking for Hall of Fame quarterback Tom Brady, winning three Super Bowls in the process. Prediction: "I will go 34-31, Patriots. I expect an exciting game just like last year, this season has been fun to watch. I believe experience will come into play at some point and one or two mistakes will create the outcome." Bakersfield ties: Stockdale High graduate in 1997. Played college football at Fresno State. Career NFL highlight: 11 years in the NFL, including five years as starting quarterback of the Houston Texans and four (2008-09, 2011-12) as backup quarterback of the New York Giants, winners of the 2011 Super Bowl. No. 1 overall pick in 2002 draft. Prediction: "Rams over Patriots. The NFC is absolutely loaded, with about six teams looking like true contenders. It's the Rams, though, who edge out the competition, and Sean McVay proceeds to out-scheme Bill Belichick for his first Lombardi." Bakersfield ties: The 1993 Foothill High graduate is currently girls basketball coach at Bakersfield High. Career NFL highlight: After a standout career at the University of Washington, Shehee played two years with the Kansas City Chiefs. His best season was 1999, when he started five games, gained 374 all-purpose yards and scored a touchdown. Prediction: Patriots over Rams, 27-20. I'm just pulling for Tom Brady to add to his greatness. I'm in awe of what he has accomplished throughout his career. Bakersfield ties: Bakersfield High graduate played college football at USC before being selected in the fourth round of the 1999 NFL Draft. Career NFL highlight: Parker played wide receiver for Kansas City from 1999-2001. His best season was 2001, when he caught 15 passes for 199 yards and two touchdowns. Prediction: Patriots over Rams, 30-17. You can't ever bet against Tom Brady. Bakersfield ties: Bakersfield High graduate in 1992 who played college football at Stanford. Career NFL highlight: Was drafted by the Miami Dolphins in the seventh round of the 1996 NFL Draft. Played three seasons with the Dolphins (1996-98), blocking for Hall of Fame quarterback Dan Marino, and one with the San Francisco 49ers (1999). Prediction: New England is my pick. Although I can't stand the Patriots from my playing days in Miami, I can't look past the success Brady and Co. have had over the years winning Super Bowls. Bakersfield ties: Bakersfield High graduate in 1998 who played college football at Fresno State with Carr. Career NFL highlight: The wide receiver was selected in the seventh round of the 2002 NFL Draft by the Buffalo Bills. Prediction: #RamsHouse Defense shows up and shows out! WATCH: What are our Super Bowl staff predictions? Check out our TBC Media staff predictions of the Super Bowl.